On this page you find some useful information regarding the buildings at the University of Canberra Bruce Campus and at other locations. Should you find this building information is outdated, please email Campus Estate. Building 1, University Entrance (south end). Building 1 from the Concourse, near the Refectory. A North End Sizzle Café, Café Mizzuna, UC Student Union, Commonwealth Bank, Study Abroad Office, Theatre Room (1A21), UC Hair Salon, and Canberra Body Piercing Clinic. B (at Concourse level) North End Women's Room, UCU Shop and Post Office, Refectory, Parenting Room, and HDR Support Office. South End Student Central comprising UC Student Centre, Inclusion and Engagement Office (for people with disabilities), Medical and Counselling Services, Student Welfare and Elite Athlete Office, International Student Support Service, ITM Service Desk, and Mini Café Mizzuna. C North End Careers Service, Multi-faith Centre (Chaplaincy), Teaching and Learning Centre, and Teaching Spaces. South End University Reception Area, Multi-Faith Centre, and Dean of Student. NOTE: Other areas of the Faculty of Health are located in Buildings 10 and 12. Other areas of the Faculty of Science and Technology are located in Buildings 2, 6, 7, 17, 19 and 27. Note: other parts of the Faculty of Arts and Design are located in Buildings 7, 9 and 20. This building contains various facilities of the Faculty of Health and the Audio Visual Support unit of Information Technology and Management (details on MyUC portal). Building 11 is connected by footbridge to Building 1 and Building 4. 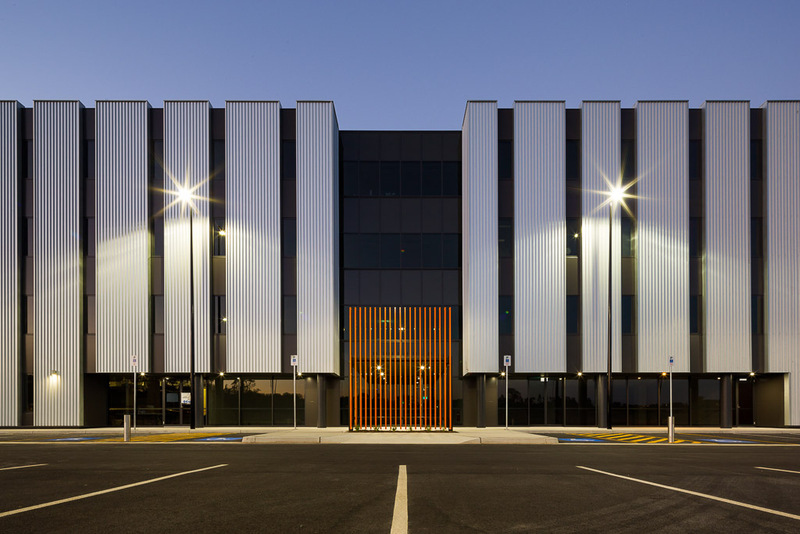 Campus Estate manages, develops, operates and maintains the University of Canberra (UC) infrastructure. The University's 539-seat Boiler House Lecture Theatre. This building is an award-winning conversion from the boiler house which formerly heated all buildings on campus. Other areas of the Faculty of Science and Technology are located in Buildings 2, 6, 7, 17, 19 and 27. This building houses the Faculty of Science and Technology storage facility. Location: 170 Haydon Drive see Google map. The Languages and International Studies disciplines of the Faculty of Arts and Design. Building 21, also known as "Cooinda Hut" is the reception for Campus Living Villages (CLV) administration. CLV manages the University of Canberra Village, including Dyara, Guginga Gurubun, Mulleum and Wagan on-campus accommodation. For further information, refer to the University of Canberra Village website for details. This modern building includes a 250-seat auditorium, offices, teaching and seminar rooms and the latest audiovisual, computer equipment and free Wi-Fi. There are also 4 apartments providing short and medium term executive style accommodation for visitors and VIP guests. The street address of Building 26 is 27 Thynne St, Bruce, ACT 2617. The main entrance is off Dunlop Court and opposite Traeger Court. The University switchboard team is now located in the Building 26 (Scrivener) Reception and provides both reception and switchboard services. The phone number is (02) 6201 5111 (or dial ext 9 from internal phones). Visitors and staff can use the phone at Reception to contact a staff member, call a taxi, etc. A Google Map of the area is here. a 'mega-laboratory' to accommodate classes of up to 100 students in chemistry and biology. a laboratory for intensive and detailed work to conserve sensitive cultural materials, and a pharmalab to serve the needs of students interested in a career in pharmacy or the pharmaceutical industry. a laboratory to provide for the hands-on and interactive educational needs of students in ecology and environmental science. 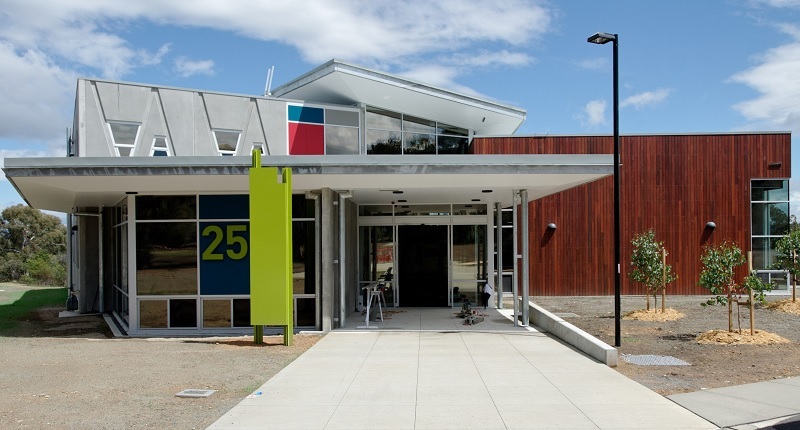 The Health Hub is home to Ochre Health Medical Centre, the Faculty of Health Clinics, Capital Chemist, Laverty Pathology, RespACT (Lung Function Testing), Canberra Imaging Group, Brindabella Hearing & Speech Centre along with Tampered Coffee. 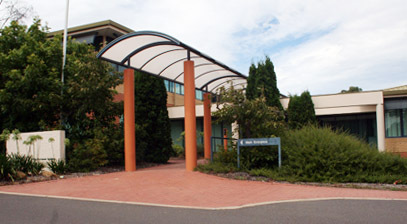 The Faculty of Health Clinics provide services to University of Canberra staff, students and the community. 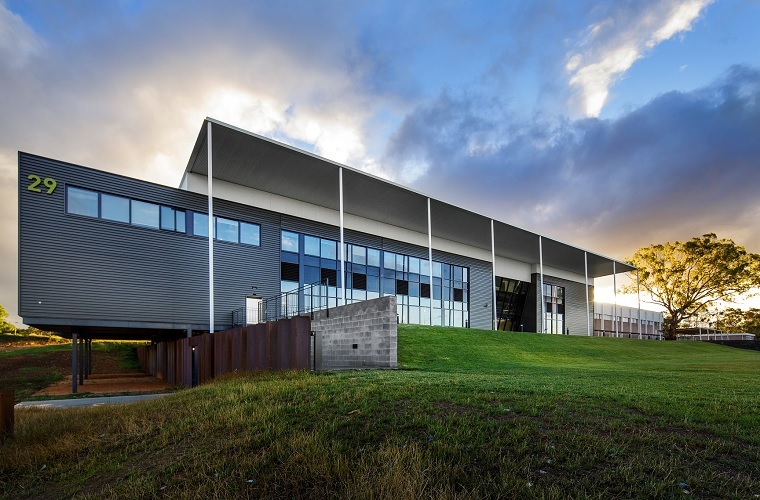 The University of Canberra's Sports Hub includes the headquarters for the Brumbies, UC Capitals, ACTSport and sports studies teaching and research facilities was officially opened by Acting Chief Minister Andrew Barr on 17th July 2014. The 3,300 square metre facility also includes three gymnasiums, medical/rehabilitation areas, plunge pools, a sauna, main oval and skills field, and a purpose-built bocce court for Special Olympics ACT. The ACT Sports Hall of Fame, UC Fit! and the UC Research Institute for Sport and Exercise (UC-RISE) will also call the building home. The partnership between the ACT Government, the University of Canberra and ACT Sport would ensure Canberra is at the forefront of development and innovation in sport. 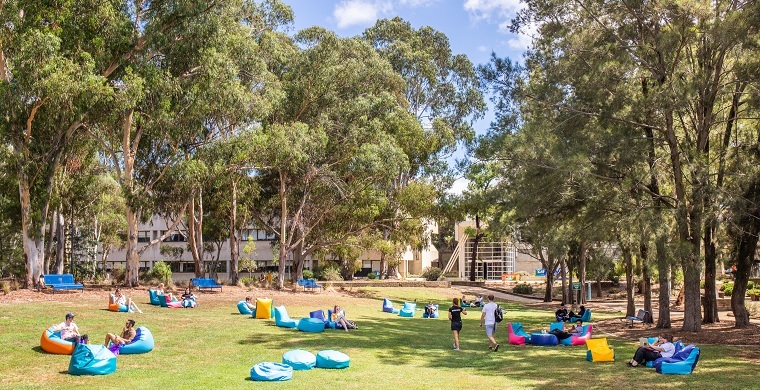 The benefits of co-locating community and elite sport at the University of Canberra include linking students with the sports industry, enhanced learning and industry resources and building economies of scale through co-location. The centre also offers and provides outreach opportunities for participation in sport and education to remote and rural communities in Southern NSW. This complex includes two buildings joined by a floating walkway, 297 self-contained studio and multi-bedroom apartments, and the creation of a ground floor public plaza with space for retail outlets. The nine-storey and five-storey buildings each have an equivalent 5 star green-star rating, as well as an undercover area for 170 bicycles and 10 motorbikes. Students will also have access to a new theatrette and open decked area. The Concourse is the outdoor area within the heartland of the campus bounded by Building 1, Building 5 and Building 8. 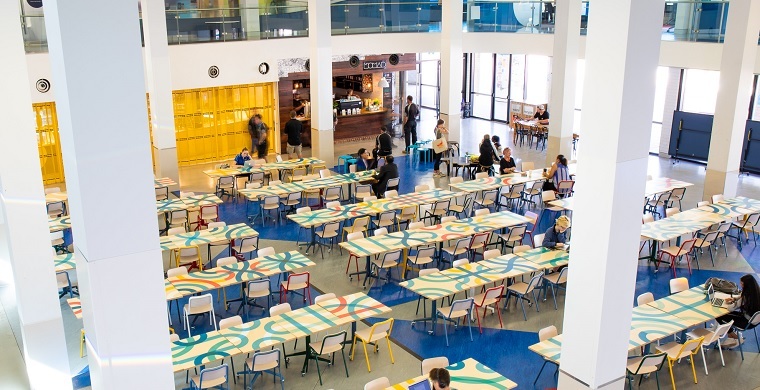 The UC Refectory is the place to meet and is also a premier entertainment venue, to see what's on see the UC Refectory website. At the UC Refectory there is plenty of food and drink options, including Nomad Coffee Shop, Rosie's Chicken, The Melt, and others. The UC Shop, including an Australia Post outlet and School Locker is located in the Concourse near the UC Refectory. The shop stocks general supplies, and UC branded clothing, including shirts, hoodies and hats. For textbooks, you will will be able to order and pickup from School Locker within store. The UC shop will also be a Mac1 Service hosting the latest Apple products. For more details and opening hours, see the UC Union website. See Google Street View for detailed walkaround the Concourse. Within the centre of the Concourse there are stairs that you down to The Hub. an underpass leading from the east side of Building 1. For more details visit our shopping, banking and eating page. The entrance to Kirinari is off University Drive South. For more details, please visit the Kirinari Early Childhood Centre website. 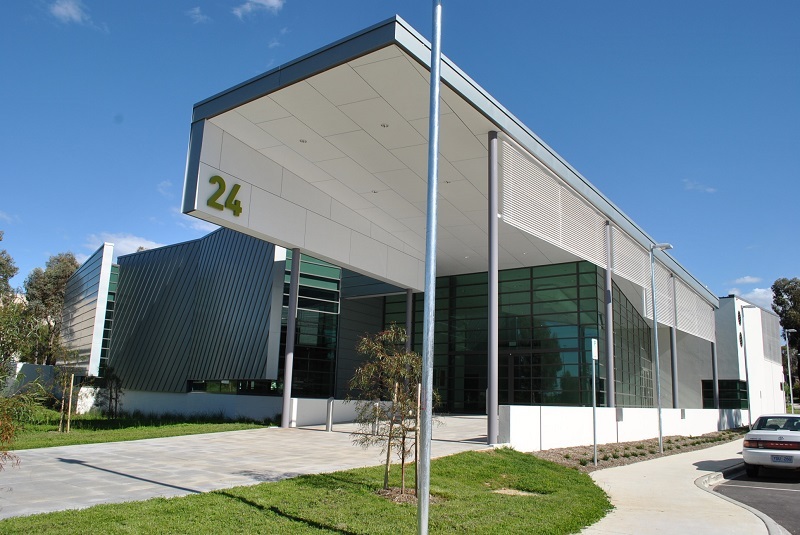 The University of Canberra Hospital (UCH) is a dedicated and purpose-built rehabilitation facility, for people over the age of 18 who are experiencing mental illness or recovering from surgery, illness or injury. See link to the UC Hospital ACT Health site. The 496-bed facility is located next to the Library, providing residents easy access to their learning spaces the growing amenities the campus has to offer. UC Lodge consists of an eight-storey main building and a seven-storey annex. A combination of single bed and multi-share dwellings are split across 353 apartments. UC Lodge is managed by UniLodge, for more information refer to UC Lodge @ UniLodge website.